Seriously Funny: Joke book or important guide to the music industry? MuseWire COLUMN: Joke book or important guide to the music industry? Author and compiler Jeffrey Weber believes it is both. One thing is certain: you will laugh, wince, howl, grimace, and laugh some more. Two musicians walk into a bar. One doesn’t order a drink. Hey, it could happen. 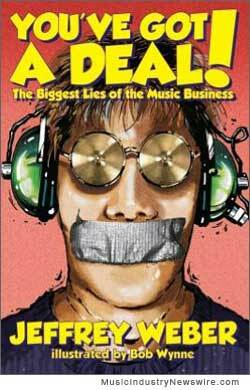 If you smiled, this book (“You’ve Got a Deal: The Biggest Lies of the Music Business”) is for you. Actually, even if you didn’t find it funny, you can learn a lot about musicians and the music business by reading this volume of jokes, tales, stories, puns, one-liners, and sarcastic observations. If you think that many of the lies you are about to read are the great truths of our business, then like me, you have been in the business way too long. If you think that some of the stuff you are about to read is especially cruel, harsh or too brutal, then you haven’t been in the business long enough. While you might be tempted to say Jeffrey Weber’s paperback opus is “cynical,” I think that “realistic” is closer to the truth. In any case, it’s damn funny. Weber writes from a position of knowledge based on his extensive experience and a wealth of inside information. “Probably too much inside information,” he says with a rueful grin. With a three-decade career in music, he has produced tracks or full albums for an incredible array of artists: From Ronnie Dio to Pat Boone. From MC Lyte to David Crosby. From Jackson Browne to the Count Basie Orchestra. From Nancy Wilson to Ritchie Blackmore. From Etta James to the Utah Symphony. His wide-ranging credits, which you can find on the StudioExpresso website, also include such artists as Steve Lukather, Marcus Miller, Michael McDonald, Chick Corea, Stanley Clark, Linda Hopkins, Kenny Burrell, McCoy Tyner, Buddy Miles, Billy Preston, Kenny Rankin, Diane Reeves, Rita Coolidge, and Luther Vandross. In addition to provoking guffaws, chuckles, giggles, and hoots of laughter, Weber feels that the book can help up-and-coming musicians prepare for some of the problems, challenges, difficulties, roadblocks, and speed-bumps they are likely to encounter along the way. In reality, You’ve Got a Deal! is an instruction manual disguised as a joke book. The opening section on “Biggest Record Company Lies” is somewhat balanced with the section on “Biggest Musician and Singer Lies.” Well, perhaps “balanced” is not the proper word because the record company lies will keep you poor while the musician and singer lies can be countered by insisting they hit the right notes and refrain from the substance abuse. Transsectional: An alto who moves to the soprano section. Weber is donating a portion of the proceeds from book sales to two organizations. The first is Reader to Reader (www.readertoreader.org), a non-profit group which distributes books to school and public libraries in the poorest communities. The second is MusiCares (www.grammy.org/musicares) which provides financial assistance to those in need within the music community. Musicians, producers, songwriters, and others in the industry are invited to participate in further editions of the book. Weber and his publisher “are looking for more great lies, stories, song titles, jokes, definitions” and more. Don’t know how long Weber will maintain this incredible accessibility, but he prints his e-mail in the book: it’s WeberWorks@earthlink.net but please just contact him with serious comments, okay? In other words, don’t you be a joke. There apparently exists, somewhere in Los Angeles, a computer that generates music for television dramas. When TV composers need a new dramatic cue, they turn on this computer; after sorting through millions of possible musical themes, it spits out “ONE LONG LOW SCARY NOTE ON A SYNTHESIZER,” and this becomes the cue. The next time they need a cue, the computer spits out “TWO LONG SCARY NOTES ON A SYNTHESIZER.” And so on, ad infinitum. We need to locate this computer and destroy it with hammers — along with TV producers and entertainment lawyers. For that item alone: Jeffrey Weber, a grateful nation salutes you. Article is Copr. © 2012 by John Scott G, and originally published on MusicIndustryNewswire-dot-com before the site was revamped as MuseWire.com in March 2015 – all commercial and reprint rights reserved.